Air travel is never a picnic these days, so you take little pleasures where you can find them. On United, one of those pleasures was the airline’s stroopwafels. But as Food & Wine reports, for now pax can say goodbye to the Dutch treat: This week, UA announced its stroopwafels would be almost entirely replaced by a “maple-flavoured cookie.” Doesn’t quite sound as inspiring, does it? Stroopwafels really are a nearly perfect airplane food. More akin to a lattice-covered cookie than an actual waffle, stroopwafels are solid, but also a touch soft, meaning, unlike with a harder cookie, you won’t be covered in crumbs once you’re finished. They’re also syrupy without being sticky, perfect for when the fasten seatbelt sign keeps you from washing your hands in the lavatory. Finally, the thin, round disks are meant to rest over a cup of coffee or tea, where the steam can penetrate the cookie and soften it up before you bite into them. 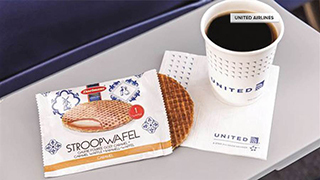 United’s take was just a touch larger than the opening of its coffee cups, making it the perfect fit -- great for cookie softening, and also useful in the event of any unexpected turbulence, when your stroopwafel could serve as a de facto lid. Yes, “crunchy” does sound like crumbs. And sadly, these small wafers will not cover your coffee. Expect to see them on flights departing before 9:45 a.m. beginning as soon as this weekend.